I have been meaning to write this post for a couple of weeks now, but I’ve been so busy USING the new light, I keep forgetting to write-up the review! Almost two months ago, I wrote a post about a new task-light I’d gotten to make my knitting easier in the evening (my 50-year-old eyes just can’t see as well as they used to!). I love that light, but had a few problems with the strap and the way it sat on my chest — I even designed a “bunting” for it to make it work for my needs. 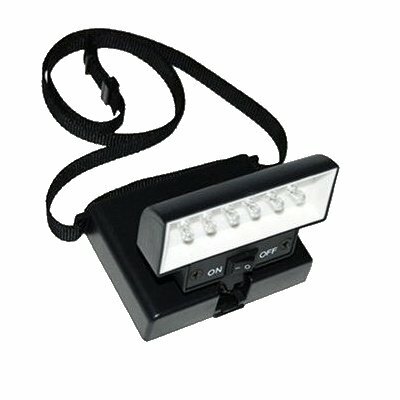 Well, it seems that the good folks at Beam-n-Read (ASF Lightware Solutions) read my post and asked if I’d be willing to evaluate their latest entry into the task-light market: the Beam N Read Deluxe LED 6-3. These were literally just shipping and weren’t even available on Amazon until Thanksgiving. Yep, that is how new the task-light is. I jumped at the chance to put the “new and improved” light through its paces and see if it was worse, as good as, or better than the one I’d purchased. Bottom line — a resounding YES it’s much better! I’ve spent the past month working this light — in the evenings sitting on the couch and knitting away at Christmas gifts, in the van on our recent adventures to SC/NC, in bed while reading the Kindle. This model comes with two filters — a red one for using in the car at night to avoid blinding the driver and a yellow one that diffuses the LED glow a bit to warm the light (which works wonderfully when reading the Kindle at night in bed). In addition, the package comes with a magnifier that you can snap onto the lamp to enlarge your work (which is great when you’re knitting an intricate stitch with dark yarn … just saying). One thing I REALLY like about this light … it takes four AA batteries (with an estimated battery-life of 50 hours when using all six LEDs and 100 hours when using just the three). This means I don’t have to try and track down specialized batteries … which are hard to find and expensive when you do! The light is still going strong on the originally-loaded AA’s after more than a month of use. The best example I can give of how well this light works is the morning we left for our road-trip over Thanksgiving weekend. In order to get down to SC in a reasonable time, we wanted to leave at 4 a.m. … when it was pitch-black (not even moonlight available). My dh likes to turn off the water to the house but it was dark in the front yard and he couldn’t see the valve. Solution: I turned on all six LEDs and held the lamp so he could turn off the water. And since I already had the lamp out, I figured …. perfect knitting time. So as dh drove through the pre-dawn mist, I knitted … and knitted … and knitted. By the time we stopped for a late breakfast, I had been knitting over three hours and it was now light enough for me to knit with the natural light. Not once did the lamp get heavy or uncomfortable. I could adjust from three LEDs (during the non-critical knitting sections) but if I had a problem, I could ramp up the light to the six. I used the magnifier a couple of times when I found I’d dropped a stitch and needed to remedy the situation immediately. The new light is a must-have for knitters or needleworkers, for those who enjoy reading in bed, or just about anyone else who needs a task-light. At less than $30, this would make a great Christmas gift under the tree or in the stocking.